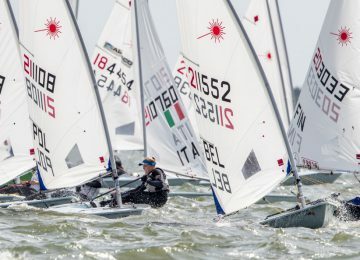 No races today due to strong winds in Warnemunde, Germany, so scores stayed the same as previous standings and new Laser Europa Cup GER were crowned early. 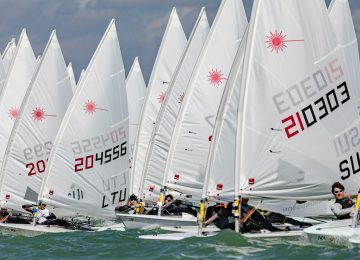 Local sailor Theodor Bauer GER (2-3-1-1-3-5) won the Laser Standard competition with 10 points, followed by Sergey Komissarov RUS in second and Maxime Mazard FRA in third, with 22 and 24 units respectively. Polish sailor Jakub Rodziewicz POL headed U21 fleet with 43 points and finally ranked 9th overall. Malik Hood HKG from Hong Kong was U19 champion with 158 points and 33rd overall. 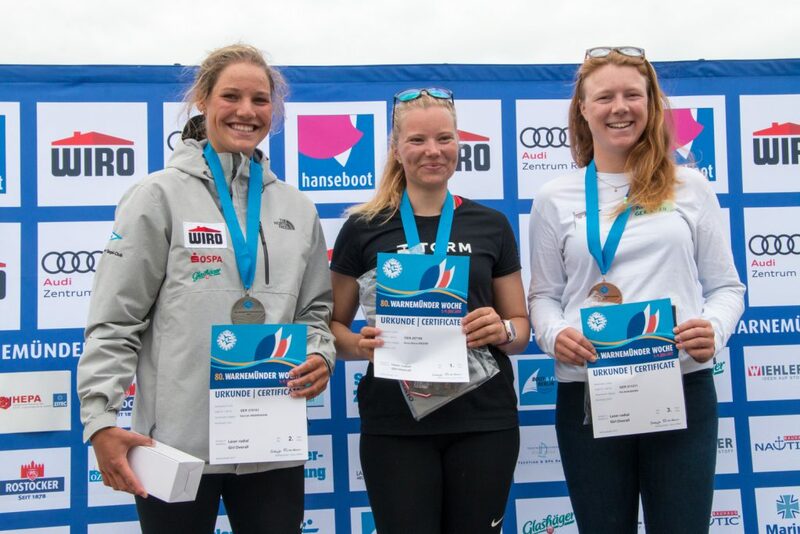 Anne-Marie Rindom DEN (1-1-1-1-2-1) was finally Women’s Radial champion, followed by German sailors Hannah Anderssohn GER (first U19) and Pia Kuhlmann GER, with 15 and 16 points respectively. Laura Frederiksen DEN and Elizaveta Borovkova RUS were U21 and U17 winners, finishing 9th and 17th respectively. 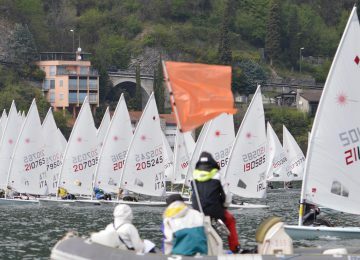 Men’s Laser Radial trophy was finally achieved by Italian sailor Federico Tocchi ITA (1-2-3-2-2-1) with 8 points, closely followed by Russian Daniil Krutskikh RUS (first U19) with 11. French sailor Nathan Le Pen FRA completed podium with 27 units. Nico Naujock GER was U17 champion and ranked 4th overall, just two points behind Le Pen. Christian Spodsberg DEN (9-5-6-4-1-1) was finally double crowned with the Laser 4.7 overall prize and also U18 with 17 points, followed by Joshua Richner SUI (first U16) with 21. Third overall and second U16 was Johan Schubert DEN just one point behind with 22. 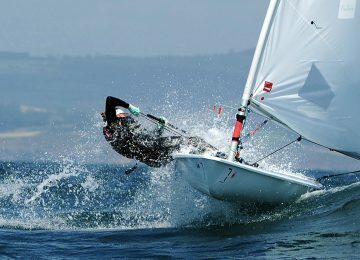 Irish sailor Eve McMahon IRL was also double crowned with Girl’s 1st place overall and U16, finishing 9th on standings. Girl’s U18 prize was for Deimante Jarmalaviciute LTU, ranked 19th overall. Thanks everyone for participating and see you on next Laser Europa Cup 2017 stop in Dziwnów, Poland, starting in August 25th. 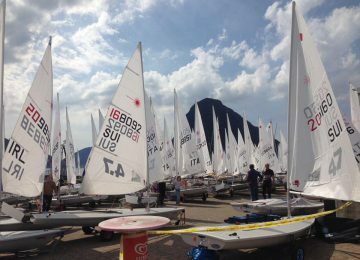 Laser Europa Cup GER – Full results here. By Agustín Argüelles – EurILCA | Photo: Pepe Hartmann – Warnemünder Woche 2017.